Desetra J. Taylor, the founder of 100% Changed™, is revered as a wise woman and serves as a role model for women from all walks of life. 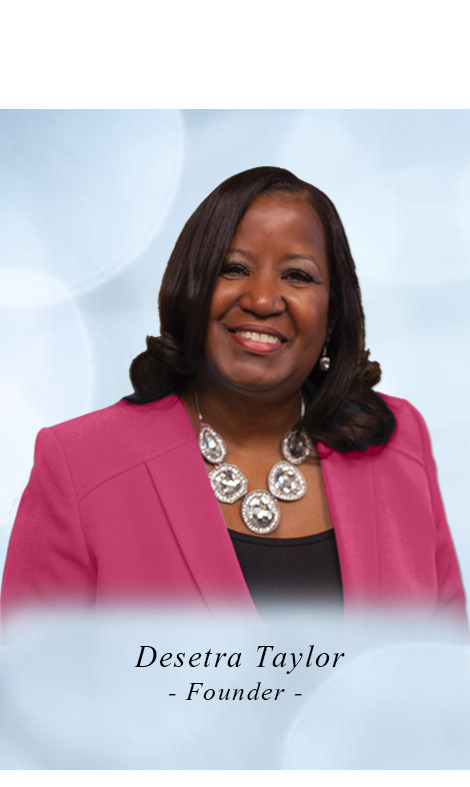 She is the loving wife of Bishop Larry Taylor, Senior Pastor of Center for Hope Ministries, a multiracial non-denominational church located in Bloomington, Illinois. Together they teach preventative, yet practical methods on maintaining a balance in the Christian life, specifically in the areas of marriage, family, and finances. Through her years of faithful dedication to ministry, God saw it fit to elevate Desetra to a new level. In December 2006, she was ordained as a Center For Hope Elder, activating a new anointing in her life for healing and restoration in the lives of God’s people. Desetra’s commitment to empowering women is evident through her lifestyle of service. She serves as the visionary of Women Positioned for Purpose (WPP), a women’s outreach purposed to teach, nurture and equip women to maximize their potential. Frequently, she hosts several women’s related events such as: retreats, workshops, Women’s Devotional Tea, Sunday school sessions, and other events to empower women. Most recently, she launched 100% Changed™, a discipleship program that encourages women to embrace a total transformation: spiritually, emotionally, and physically, while cultivating a more intimate relationship with Christ. The program launched in the fall of 2007, with 12 highly motivated women. Currently, Elder Desetra Taylor is making plans to expand the program to cater to the needs of women executive leadership and pastor’s wives. In addition to serving in ministry, Desetra is keen on the business affairs of corporate America. After earning a Bachelors of Science from Illinois State University, she worked in the insurance field for over 20 years. Her most recent business endeavor was the launching of a travel consulting business, Premier Travel, designed to organize luxury vacations for upscale travelers seeking destinations within the US, and various parts of the Caribbean. These are just a few noteworthy accomplishments First Lady Taylor has acquired throughout the years. Though great in their own right, she considers supporting her husband in ministry and raising godly children her primary accomplishment. She faithfully serves as her husband’s helpmate and she is actively involved in the lives of their children.